I'm taking a break from painting the bathroom so I can paint my nails! Color Club Broken Tokens is one of six shades in their Fractured Collection, and I'm hoping they all have a formula as nice as this one. 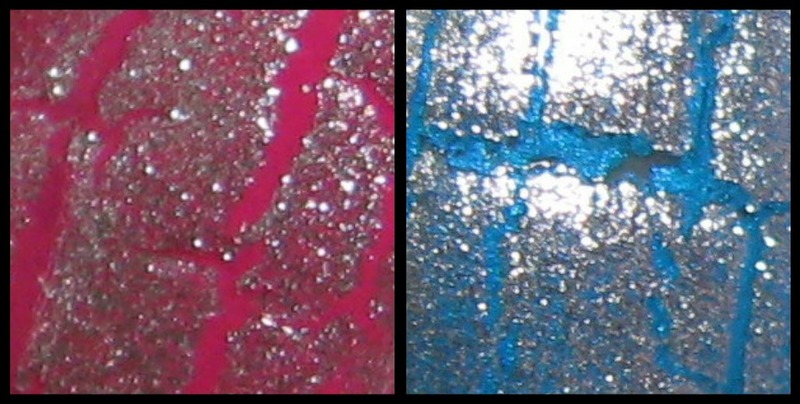 I used one coat and this sparkly silver covered easily, dried quickly, and fractured itself perfectly! 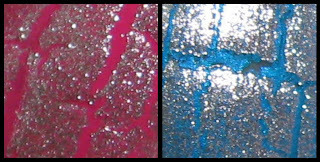 The top photo is shown over Zoya Phoebe, while the bottom photo is shown over Zoya Lolly. Macro shot of the fractures. Every time I use a crackle polish I hear the Rolling Stones singing Shattered in my head for some reason! Broken Tokens has very fine glitter and it's a bright lighter shade of silver. I used one coat with a medium amount of polish on the brush and if you use a thinner coat, you'll get more fractures with smaller line breaks. When I tried the China Glaze creme crackles earlier this year, I wasn't too impressed with the formula. Then I tried OPI's Shattered...is that Mick Jagger I hear again?--and I thought that was a better formula. Last week I used one of the China Glaze Metal Crackles and thought that was a perfect formula. Now that I've tried one of the Color Club's, I'll say that their formula may be the best I've tried so far. I'm going to give the black and white shades (cremes) a try tomorrow, so I'll be very interested to see how those compare to some of the other cremes on the market. Sounds exciting! 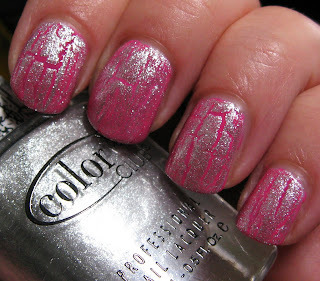 I have two of the china glaze creme crackles, and I've had some problems with them crackling the way I want them to.. Especially the white! What a nice surprise! And how kind of you to offer these up as a give away! I would be super honored to be in the running for these! I am liking your swatches here...this silver FAR surpasses the silver from OPI shatters. I was not even tempted to buy the OPI one after seeing it on the display swatches. It was dirty or something that just did not do it for me at all. Looking forward to the spread of crackles to metallics now vs. the creams we saw tons of. I haven't tried China Glaze crackles. Love the Sally Hansen. The Color Club is really pretty. Is anyone still having trouble with blogger? I'm so disguisted with it that I haven't been on the blogs. It's really upsetting and I don't know how to fix it. I've cleaned everything I can and cleared the cache a million times. I bought- the tri-pack of Zoya mod mattes minis a shot time ago, and it has Molly, Phoebe and also a bottle of China glaze crackled Nail glaze. So I can actually do this one now. I am so amazed at how this effect turned out on your nails, amazing. @makeupgirl21 one of my facebook friends suggested unchecking the "keep me signed in" box when you sign into blogger. It worked for me.